Parklet users lounge at the 265 S. 44th St. parklet, located outside of Honest Tom's Taco Shop in University City. As part of the American Institute of Architects Convention 2016, rolling into town from May 19-21 at the Pennsylvania Convention Center, AIA is hosting a parklet design competition that will result in two dozen or more pop-up parklets on the south side of the 1200 block of Arch Street. 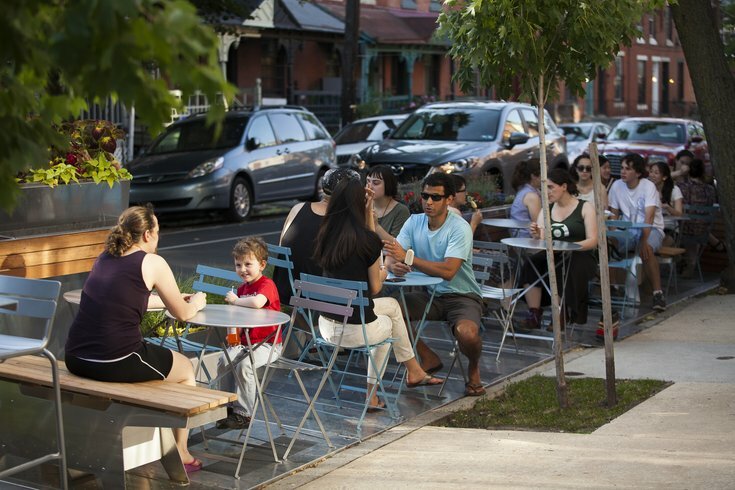 For an entrance fee of $125, Philadelphia design firms and organizations can register to create a parklet that will be available for public use for one eight-hour day, on either May 19 or May 20. Both days will feature a dozen parklets each, totaling about 24. The street will remain open during the competition. Infrequently Asked Questions: When did Rittenhouse Square get its ritzy rep? The most innovative participant during each day will be awarded $1,250 by a team of AIA jurors. A separate prize, the Architect's Choice Award, will be awarded by conference attendees. Those interested can register through April 7. A draft of concept that limits material and installation costs to $1,000 or less is due by 5 p.m. on April 8. In recent years, the parklet concept -- that is, the transformation of a parking space into seating areas -- has blossomed out of a string of San Francisco parklets. In Philadelphia, University City District has paved the way for their development, even issuing an impact report last year that demonstrated their strength as an economic boon to their surrounding businesses. Parklet season in Philadelphia runs from April to December.